Absolutely perfect. The rooms were good, the beds were the best I've had. So much privacy, even in a 6 bedroom dorm! Loved it. Was a shame I had to leave after 3 nights, but that was only because my trip had to move on. Can't wait to be back. 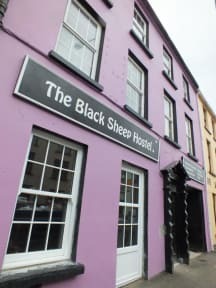 Absolutely great stay in the Black sheep hostel in Killarney. Can't wish for anything more! Comfortable place. Good facilities. Very cool people and commited staff. Could dry my shoes at the fireplace. Diverse breakfast options (bread, eggs, oatmeal, fruit, different teas). There was one noisy improper drunk traveller returning in the middle of the night. After recalling the disturbance to the receptionist, she promised to have a word with him. Way to go!